Poet, lover, rebel, exile, freedom fighter, Lord Byron lived the life of the romantic heroes he wrote about and set the pattern for all free-spirits challenging convention ever since. The Byronic spirit lives on but his earthly remains rest here in the family vault. George Gordon Byron was born in London but his formative years were spent in Nottinghamshire in order to be near Newstead Abbey which is four miles from here; the crumbling country house he inherited along with his title when he was ten. To the teenage Byron Newstead’s lonely gothic ruins, haunted by past glory, slowly being reclaimed by nature was the essence of a romantic landscape. At fifteen Byron also found his first love, Mary Chaworth, a distant cousin from nearby Annesley. Both Mary and Newstead would feature many times in his work throughout his life. By 1812 he was a famous poet whose many unconventional love affairs fascinated and appalled English society. Byron could not conform, and a brief marriage ended when he separated from his wife and eight week old child, Ada. Byron left England in 1816 in search of freedom, never to return alive. His journey ended in 1824, aged 36 fighting for freedom in the cause of Greek independence from the Ottoman Empire. The romantic hero as an outcast or an exile, attempting to break free from convention and searching for their own personal journey to fulfilment was new and has inspired many since; composers, artists, philosophers, revolutionaries, film and rock stars. Many like Byron would die young having changed the world. Byron introduced a hero based on his personal journey in his long poem Childe Harold’s Pilgrimage. 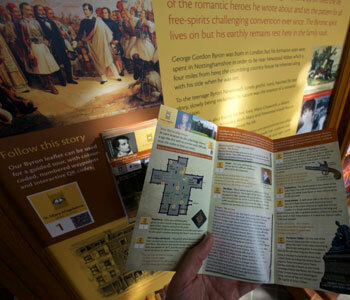 You can take a leaflet and follow a Byron Pilgrimage around the church to his last resting place, beneath the chancel. Click here to download a PDF version of our Lord Byron pilgrimage tour leaflet, but you’ll need to visit to make the most of it.